"It's Always Sunny in Philadelphia." 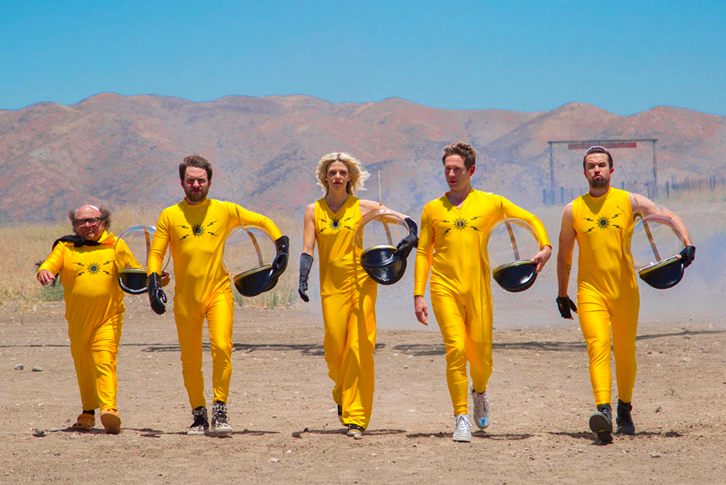 The long, cloudy wait for Season 13 of "It's Always Sunny in Philadelphia" will likely extend for a while before we can tune in for a slate of new episodes. It's definitely not helping matters that Netflix no longer has the old ones available to stream. Is there a silver lining here? Well, if Charlie Day says so, it's a lot better than if Charlie Kelly says so. The Wrap recently caught up with Day about his upcoming role in "Hotel Artemis," a film in which he'll play an arms dealer hiding out in a secret hospital for criminals. The backdrop is a massive riot in Los Angeles in 2028. Day also was asked about the future of "It's Always Sunny in Philadelphia," which is under contract to produce its 13th and 14th seasons. Completing 15 seasons would make the series the longest-running television comedy in American history. They've already outdone "Seinfeld" (9), "Friends" (10), "Cheers" (11) and several other consensus all-time greats. Season 14 would tie the show with "The Adventures of Ozzie and Harriet," which aired on ABC from 1952 to 1966. The longest running animated comedy in the U.S. is "The Simpsons," with 29 seasons and 639 episodes since it's debut in 1989. Day also said that fans "should feel hopeful" about some sort of role for Dennis Reynolds in the next season of "It's Always Sunny in Philadelphia." Glenn Howerton's NBC sitcom "AP Bio" recently was renewed for a second season and has led to speculation that Dennis' departure at the end of Season 12 was intended to accommodate his other creative projects. Howerton remains a part of the core writing team for "It's Always Sunny in Philadelphia" alongside Day and Rob McElhenney. Kaitlin Olson and Danny DeVito both stay on board for the upcoming season. It's probably time to put the Dennis Reynolds speculation to rest. He'll be a factor. Day wouldn't elaborate. "It's top secret," he told The Wrap. "I can't say anything."